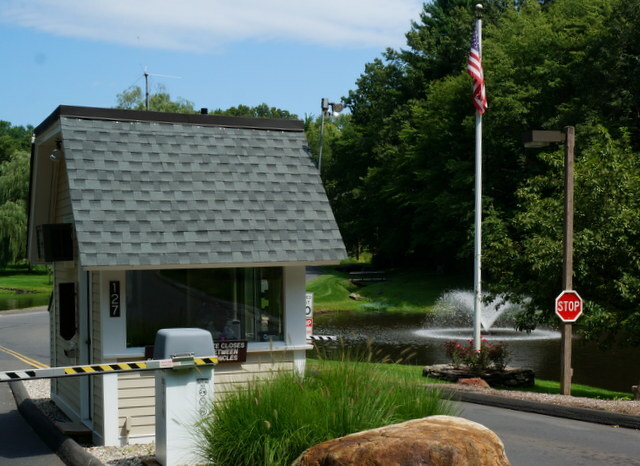 The community was originally started in 1970 with a carefully thought-out master plan, featuring a clubhouse, golf course, swimming pools and tennis courts. Today, there are 1084 residential condominium homes on over 350 acres of rolling countryside. 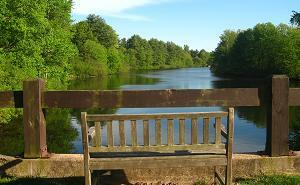 There are approximately 35 acres in Farmington, CT and the balance of the property is in Avon, CT. The large variety of home styles results from five different builders developing the community over a 30 year period, the last new construction was completed in 2001. There are over 60 different floor plans in the community. They include ranch and townhouse style layouts. Consisting of 1,2,3 and 4 bedrooms, 900-3800 square feet, detached and attached 1 and 2 car garages. Footings include on grade slab, crawl space, sub grade and walk-out basements. Central air conditioning, fireplaces and a patio or deck are typical in units. There is on-site management with a permanent management staff, building and grounds crew, all working side by side with a resident Board of Governors and various resident committees to provide a well cared for environment. The response time in addressing maintenance issues is improved because the grounds and building staff are dedicated to this community only vs. an offsite management company handling several condominium communities simultaneously. This creates a more consistent level of maintenance and a greater sense of pride and accountability on the part of the association staff. There is a Clubhouse with 16,000+ square feet, housing full service restaurant and pub, banquet/activity/meeting areas, mens and womens locker rooms, golf course pro shop. This facility is available for all residents of the community and is open year round. There are four swimming pools, each in its own park-like setting. The enchanting upper Byron pool sets high with a deck cantilevered out over a hillside. The 25-meter heated Guilford pool with large patio surround is great for lap swimming. The private and secluded Mallard pool offers a quiet retreat. The Greenwich pool is designated as a "quiet" pool for rest and relaxation. Seven tennis courts (4 lighted for night play) are located in different parts of the community for convenience. There is an active tennis league, which organizes matches throughout the season. A paddle or platform court is available for winter use. There is also an irrigated vegetable garden area for residents to grow the crop's of their choice. Few condominiums have space for this amenity, which forces many people to give up this satisfying pastime when moving to a condominium. Two gated entries offering security, 24 hours a day, 7 days a week, offering convenience and security. The other gate is accessed by a proximity card key system. The entire property is built around an 18-hole USGA golf course, designed by Desmond Muirhead. During the 1970’s, the qualifying rounds for the Greater Hartford Open were played on this course. The Association owns the golf course and membership is optional. Any resident may play on Mondays or Sunday afternoons by paying a greens fee. For additional information call the pro shop at 860-673-0062. Since the first units were built, the complex has become financially viable. Control of the association was turned over from the original developer to the homeowners association in 1978. As the years have gone by creating a history of operation, virtually every capital expense cycle has been encountered and properly budgeted for. Because there is one umbrella association and budget, the general appearance of the property is consistent throughout. 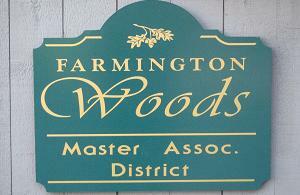 Farmington Woods is also a separate tax district. Farmington Woods enjoys a mixed profile of residents of all age groups. Because of the diverse age mix and many professional backgrounds there are always individuals who are enthusiastic about contributing their time and talent to the Association Board. There are also committees and clubs as well as a number of social functions.